Since its creation in 1974, the European Council has evolved from an informal meeting of presidents and prime ministers, resembling a cross between a society gathering and a diplomatic conclave, to become a full EU institution in its own right and the Union’s supreme political authority, driving its strategy and resolving its crises. Nothing of any significance in the Union can now be set in motion without its consent, nor accomplished without its support. This book tells the story of how this came about. 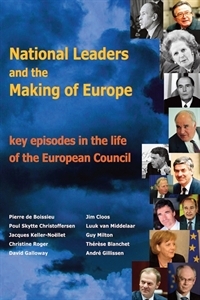 Individual chapters describe landmark meetings of the European Council, providing a detailed account of what went on at each summit, evoking the atmosphere and tensions and drawing out the achievements and longer-term significance. As well as high-level politics and the great issues of the European project such as enlargement to the East, treaty reform and the creation of the single currency, the story also involves the clash of strong personalities, sub-plots and moments of high drama. The authors are serving or former senior EU civil servants who have all been closely involved in preparing and attending European Councils. Very few officials have such intimate access. They therefore write as first-hand witnesses of events as they happened, offering new perspectives and insights.